As part of the ongoing work of the Centre, staff have been sharing their research at a number of conferences. At the The History and Antiquities of St David's... Revisited conference (June 2006), John Morgan-Guy presented a paper which focussed on the artwork of the restored east wall of the Presbytery of the Cathedral. 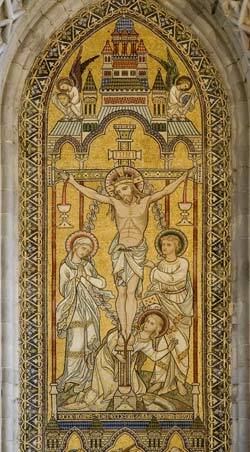 The stained glass and glass mosaics date from 1870 and 1871 and the paper analysed the biblical themes in the artwork and also explored the relationships between architect, artist and patron. The presentation was illustrated with new photography by Martin Crampin recorded as part of the fieldwork for the Imaging the Bible in Wales project. The paper will be publushed as part of the conference proceedings in due course. 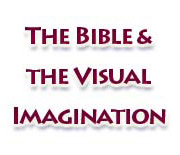 At the Annual Assembly of the Union of Welsh Independents in Lampeter (July 2006) John Morgan-Guy and Martin Crampin discussed familiar and unfamiliar biblical imagery in an illustrated talk. Demonstrating the process of iconisation through the reproduction and adaption of images, the paper also focussed on images of the person of Christ and challenged the popular representation of Christ during the nineteenth and twentieth centuries.